Will 2016’s presidential coattails be long or short? When you look at the big picture of presidential elections, and you try to discern the connection between the White House contest and the 34 Senate elections on the same ballot, it becomes obvious there are two types of years. The first type we might call “disjointed.” Voters seem to be separating their judgments about these very distinct offices in most competitive races. The presidential candidate who wins adds only a handful — or fewer — additional Senate seats to his party’s total. The presidential coattails are short. The second type could be termed “intertwined.” The candidates for the White House are very polarizing and distinct, and one or both major-party contenders color the voters’ perceptions of all officeholders on the same partisan label. The party whose letter (D or R) becomes toxic loses a substantial number of Senate seats; thus, the presidential coattails are long. 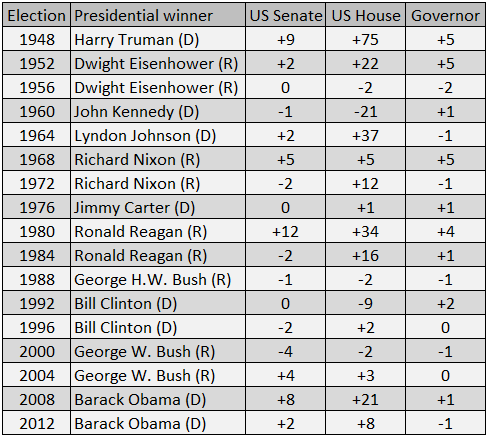 The second type is somewhat rarer, to judge by the elections for president since World War II, as shown in Table 1. However, the six-year cycles of the three different Senate classes and the current party makeup of each class obviously matter. For instance, the Democrats only gained two net Senate seats in 1964, a seemingly small increase considering Lyndon Johnson’s landslide victory. But six years earlier the Democrats netted 15 Senate seats in the 1958 midterm election, meaning they already controlled a large majority of seats in Class 1, the group of states up in 1964. Conversely, the Republicans won 12 net seats in 1980 when the Democrats entered the cycle controlling 24 of the 34 seats up in Class 3 (which is the same class up in 2016). Notes: Because of independent or third-party members, vacancies, and other factors, gains or losses for the winning presidential party do not imply the exact opposite result for the other major party. The results are the gains or losses based on the makeup of Congress and the governorships just before Election Day and after, not the change from the previous election’s result. No one can say for sure to which category 2016 will belong, but our early expectation is “intertwined.” Considering the rise of Donald Trump, the polarization in U.S. politics, and a higher rate of straight-ticket voting, this could be bad news for the GOP. We have already sketched out a “Trumpmare” doomsday presidential scenario for the Republicans, who control the Senate now by a margin of 54 to 46. Assuming the GOP nominee for the White House is either Trump or Ted Cruz, we think the Democrats will fare reasonably well down-ballot (more so with Trump than Cruz, though Cruz will also have a difficult time carrying many swing states). 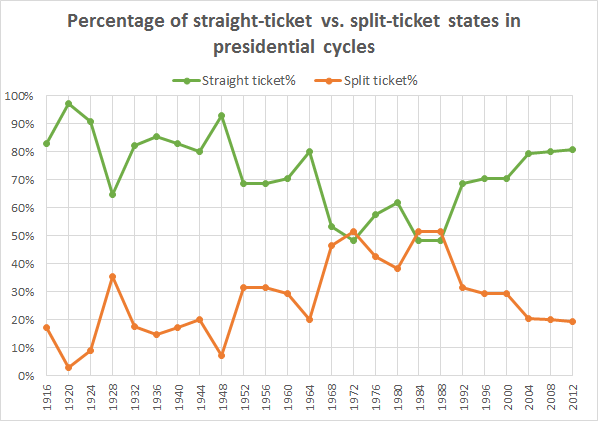 As shown in Chart 1, in recent presidential cycles, about 80% of states with Senate elections have backed the same party for the presidency and the Senate. In light of the fact that Republicans control 24 of the 34 seats up in 2016, including many in states that President Obama won in 2008 and/or 2012, straight-ticket voting could bode poorly for the GOP. Note: Excludes Senate contests where an independent or third-party candidate won and/or where an independent or third-party presidential candidate won the state in the Electoral College. As we explain below, the Crystal Ball is changing six Senate race ratings, all in a Democratic direction. This does not mean Democrats will actually win all six, though one was already leaning toward the Democrats. As for the other five, two races are now designated pure Toss-ups, and the three other states where we are making a change still favor Republicans, though less so than earlier. There is a clear if premature trend here. The coattails question also matters for the 12 gubernatorial contests that will take place in November. A weak Republican presidential nominee could endanger GOP incumbents running for reelection in Indiana and North Carolina, prompting us to also shift the ratings for those contests in the Democrats’ direction. Before jumping into our Senate and gubernatorial ratings changes, it should be mentioned that elections for the House will also be influenced by coattails. But we’ll delve into the lower chamber’s state of affairs next week. Colorado: Coming into the 2016 cycle, it was pretty clear that the Republicans would largely be on the defensive. Only two Democratic-held seats stood out as ones the Republicans could hope to win, one of which was Colorado (with the other being Nevada, now an open seat on account of Senate Minority Leader Harry Reid’s retirement). Sen. Michael Bennet (D) has proven to be more resilient than some might have thought. After being appointed in 2009 to replace Sen. Ken Salazar (D), who had just entered President Obama’s Cabinet as Secretary of the Interior, Bennet seemed extremely vulnerable in the buildup to 2010 due the environment and his lack of electoral experience. Moreover, Bennet had to survive a strong primary challenge from former state House Speaker Andrew Romanoff (D). But Bennet was fortunate when now-Rep. Ken Buck (R), a social conservative, won the GOP nomination, and the appointed incumbent went on to eke out a two-point win in November. At the outset of this cycle, Bennet appeared a slight favorite to start, but now it looks as if he may hold a stronger edge. Bigger-name GOP politicians — including Rep. Mike Coffman (R), Colorado Attorney General Cynthia Coffman (R), and Rep. Scott Tipton (R) — declined to challenge Bennet in a presidential cycle. Instead, the Republican field is a logjam of double-digit proportions, though only five candidates officially filed petitions to get on the primary ballot. Other candidates will try to get on the primary ballot by getting at least 30% of the vote at this weekend’s state Republican convention. Whoever wins the GOP nomination on June 28 will have a serious financial deficit to overcome as Bennet had $6.7 million in the bank at the end of 2015. More importantly, just as the circumstances at the presidential level have weakened the ratings for a number of GOP Senate incumbents, they have improved Bennet’s odds as the only potentially vulnerable Democratic Senate incumbent. The Centennial State race shifts from Leans Democratic to Likely Democratic. Iowa: Sen. Chuck Grassley (R) is a political institution in the Hawkeye State. Famous for the “Full Grassley,” whereby he visits all 99 Iowa counties every single year, Grassley has a proven record of popularity: Remarkably, he has won more than 60% of the vote in each of his five reelection campaigns. The six-term senator now seeks a seventh, and initially few could imagine him having any trouble. However, national politics has intervened. Following the GOP takeover of the Senate after the 2014 election, Grassley became chair of the Senate Judiciary Committee. The death of Associate Justice Antonin Scalia has left a vacancy on the U.S. Supreme Court, placing the court debate and its attendants — including the Senate Judiciary Committee — under the political microscope. While Grassley agreed to meet with Merrick Garland, President Obama’s nominee for the opening, the senator has maintained that he will not hold a full hearing to consider Garland’s nomination. Perhaps sensing that Grassley might have some unexpected vulnerability to exploit, former Lt. Gov. Patty Judge (D) has jumped into the race to take on Grassley. Although she must first defeat state Sen. Rob Hogg (D) and two other candidates in the party primary, Judge’s entry into the contest turned heads: Since winning the seat in the Republican wave of 1980, Grassley has not had to face anyone who previously held a statewide office. At least so far, however, Grassley remains popular despite the ongoing Supreme Court debate. A recent Des Moines Register/Mediacom poll pegged his approval/disapproval at 57%/28%, a strong showing in this day of political frustration, particularly in a closely-divided swing state. The Hawkeye contest moves from Safe Republican to Likely Republican, mostly out of an abundance of caution. It’s also worth noting that while the DC Democratic establishment is with Judge, many local Democrats back Hogg, so Judge has some work to do even within her own party. Missouri: Sen. Roy Blunt (R) is still a favorite to win reelection. But it’s possible that his Democratic opponent, Missouri Secretary of State Jason Kander, could spring an upset if Trump (or perhaps Cruz) is leading the GOP ticket in November. While Missouri is more likely than not to go Republican at the presidential level — Barack Obama won by seven points nationally in 2008 but still lost the Show Me State by 0.1 percentage points — the closer the presidential contest, the fewer split ticket voters Kander has to find. And Missourians have shown some tendency to turn in mixed ballots: In 2012 Mitt Romney won by nine points, but Sen. Claire McCaskill (D) defeated controversial Rep. Todd Akin (R) by nearly 16 points. In that same election cycle, incumbent Gov. Jay Nixon (D) won reelection by 12 points, and Kander won an open-seat contest for his current office by 1.5 points. So it’s certainly not inconceivable that Kander, considered a great recruit for Democrats, could surprise Blunt. Still, the incumbent Republican is a prodigious fundraiser who had $5 million in his war chest at the end of 2015 compared to Kander’s $2 million. So while Kander’s climb may not be as steep if the Republican presidential standard bearer struggles, beating Blunt will be no easy feat. We are shifting this contest from Likely Republican to Leans Republican. North Carolina: Having easily dismissed a trio of primary challengers on March 15, Sen. Richard Burr (R) can now focus on the general election, where he will face ex-state Rep. Deborah Ross (D), who won her party’s nomination to take on the incumbent. To a greater extent than Missouri, the new rating in North Carolina comes down to basic coattail math: If the GOP presidential nominee falters, the Tar Heel State will likely be the first red-state domino to fall because Romney only carried it by just two percentage points in 2012. With Trump or Cruz as the nominee, it’s possible that Democrats could carry North Carolina in November, boosting Ross’ chances. A similar thing happened in 2008 when then-state Sen. Kay Hagan (D) rode to victory with the help of Obama’s statewide win as well as the poor campaign of incumbent Sen. Elizabeth Dole (R) in that cycle’s North Carolina Senate tilt. An often underestimated candidate who outperforms on Election Day, Burr is in the news a good deal because of the Intelligence Committee he chairs; he certainly remains the clear favorite at this point, with buckets of money to spend against Ross and a history of electoral success. But Burr should join GOP senators in 2008 and/or 2012 Obama states running for reelection in keeping a watchful (read: concerned) eye on the Republican presidential nomination contest. 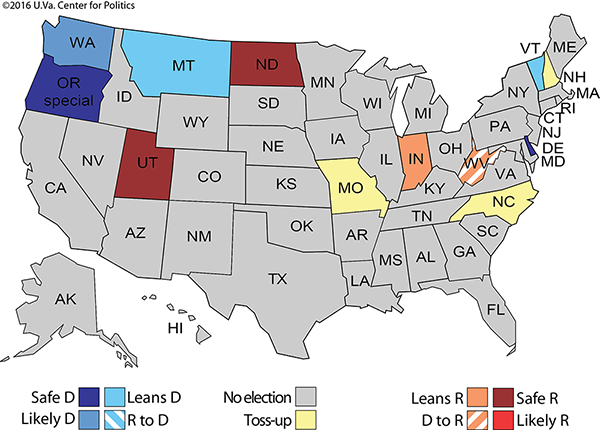 The Tar Heel State race moves from Likely Republican to Leans Republican. Ohio: While Sen. Rob Portman (R) is a skilled, well-funded incumbent who is widely respected on Capitol Hill and by his party’s leadership, he does not have the built-in statewide name ID and persona that his two predecessors in this seat possessed, former Sens. George Voinovich (R, 1999-2011) and John Glenn (D, 1974-1999). So we would not expect Portman to run considerably ahead of the GOP presidential nominee in a state that should reflect the national presidential voting. That gives former Gov. Ted Strickland (D) an opening, and he has to be delighted with the presidential outlook so far: Strickland’s friend and ally Hillary Clinton is well on her way to securing the Democratic nomination, while the Republicans, as noted previously, appear likely to nominate someone out of the mainstream. Last year we took an in-depth look at Strickland’s potential path to victory, which could include doing a little bit better in Strickland’s native Appalachia than President Obama did in his two Ohio victories. The GOP presidential nominee will likely do quite well in Appalachian Ohio — that may be especially true for Donald Trump, who has dominated the primary vote in that region — but it’s not impossible to imagine a small crossover vote for Strickland, who used to represent many of these counties in the U.S. House. Portman should still be able to use the power of incumbency and his immense funding edge — Portman has $13.5 million in the bank, while incomplete numbers show Strickland at only a little over $2 million — to run a few points ahead of the presidential ticket, but that might not be enough. 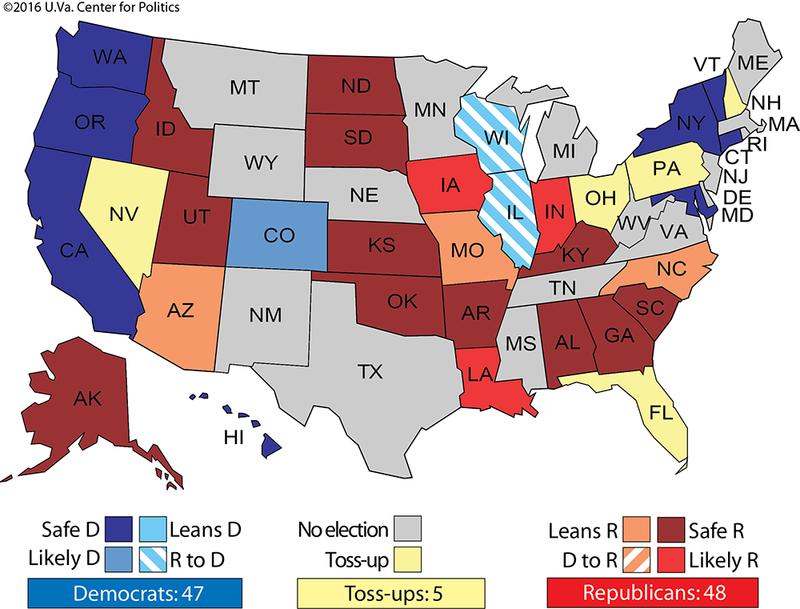 This race moves from Leans Republican to Toss-up. Pennsylvania: For the second cycle in a row, the Democratic Senatorial Campaign Committee has not only endorsed in the Keystone State’s Senate primary but is also spending money to influence the primary, which is highly unusual for a party committee. The DSCC must really dislike former Rep. Joe Sestak (D), who it is trying to defeat in the primary for the second time in six years. Sestak foiled the DSCC in 2010 by defeating party-switching Sen. Arlen Specter in the Democratic primary, but Sestak lost the general election to Sen. Pat Toomey (R) by only two points. This time, the DSCC is backing Katie McGinty in the primary — as are President Obama and Vice President Biden — over Sestak and Braddock Mayor John Fetterman. McGinty, who most recently served as chief of staff to Gov. Tom Wolf (D), ran in the 2014 gubernatorial primary and only won 7.7%, but she’s become the establishment favorite against Sestak, who is not a strong fundraiser and who marches to the beat of his own drummer. The primary dissension would seem to benefit Toomey, who like Portman is going to be very well-funded, but Toomey faces the same challenges Portman does (and maybe more so) in having to run significantly ahead of his top-of-the-ticket Republican “running mate” in November. Toomey’s reelection bid is now also a Toss-up, instead of Leans Republican, and it has very little to do with the particulars of the Senate race in Pennsylvania. Rather, it’s because of the potential for the GOP nominee to drag down Toomey even against a relatively mediocre opponent. Indiana: One of the surprising margins on Election Night 2012 was now-Gov. Mike Pence’s (R) closer-than-expected win over former state House Speaker John Gregg (D). Pence won by just three percentage points and ran about 4.5 points behind Mitt Romney, who easily carried the state in the presidential race after Barack Obama very narrowly won it in 2008. Gregg is running again. Since winning, Pence has had some shaky moments, most notably a controversy over a 2015 bill that some believed would legitimize discrimination against gays and lesbians. More recently, Pence signed a bill that made Indiana just the second state (along with North Dakota) to outlaw abortions that parents seek because the fetus has been diagnosed with a disability. Gregg, who opposes abortion rights, argues that the bill goes too far. While Indiana is the most conservative state in the Midwest, it’s fair to wonder whether social issues could hurt Pence in his reelection bid. But the bigger problem for Pence is one he shares in common with the other incumbents discussed here: The GOP’s problems at the top of the ticket could potentially trim the Republican presidential nominee’s margins in Indiana, or even allow the Democratic nominee to carry the state, as Obama did once. Obama’s 2008 victory didn’t prevent Pence’s predecessor, Mitch Daniels (R), from easily winning reelection with 58% of the vote, but Pence isn’t Daniels, and he has not yet displayed the kind of crossover appeal that his predecessor enjoyed. Pence remains a favorite in his rematch with Gregg, but we’re moving the race from Likely Republican to Leans Republican. North Carolina: The Tar Heel State’s statehouse race has always been the marquee gubernatorial contest this cycle. Not only is North Carolina the most populous state holding a gubernatorial race this year, but it’s also one of only two gubernatorial states (the much-smaller New Hampshire is the other) that are likely to be presidential swing states in the event of a close national race. Gov. Pat McCrory (R) has generally had fairly weak approval numbers throughout his time in office, and he is now dealing with a challenge similar to the one Pence faced last year: McCrory just signed a bill that bans cities from creating local policies dealing with gender-identity discrimination and forces transgender students in public schools to use the bathroom that corresponds with their birth gender. There’s been a backlash over the law, and it has so far led PayPal to cancel plans to create 400 jobs in the state. Republicans have long recognized the threat that Attorney General Roy Cooper (D) presents to McCrory, and both sides are gearing up for an expensive, nasty race. Because of incumbency, we were giving McCrory the benefit of the doubt. But no longer: A Donald Trump or Ted Cruz nomination could very well allow the Democratic nominee to win North Carolina, and even if the GOP nominee does carry North Carolina in the fall there’s no guarantee that McCrory will run ahead of the presidential ticket. McCrory’s reelection bid moves from Leans Republican to Toss-up. The technically nonpartisan and unicameral but Republican-controlled Nebraska legislature appears close to ending the state’s unusual method of awarding electoral votes by congressional district. On Monday, the legislature beat back a filibuster of the measure, which would award the statewide winner all five of the state’s electoral votes. Gov. Pete Ricketts (R) supports the bill, and it appears likely to eventually pass and reach his desk, according to the Lincoln Journal Star. Currently, only Nebraska and Maine award electoral votes to the winners of congressional districts, and under our current Electoral College ratings of a potential Hillary Clinton-Donald Trump matchup we listed Nebraska’s Second District as only Leans Republican, while Nebraska itself was Safe Republican. The Second District, based in Omaha, gave its electoral vote to Obama in 2008 but then voted for Romney in 2012. We’ll adjust our ratings accordingly and make all of Nebraska’s electoral votes Safe Republican if in fact Nebraska’s leaders change the law.